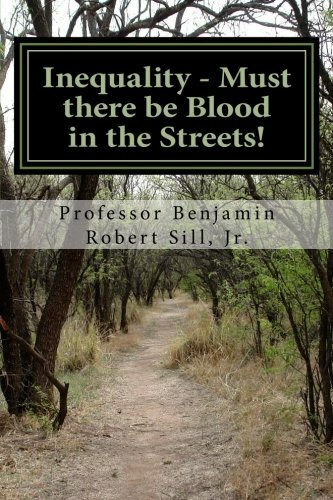 Prof Benjamin Robert Sill Jr Inequality - Must There Be Blood in the Streets! Which is worse? That we are becoming a second class society, or that the wealth gap is larger than at any time in history? Other countries are not the enemy, the rich and powerful in all countries are. In today's world of instant communication the information is readily available that says the average person is being left out. How come we allow it? Is it that we don’t care, or that we don’t know how to fight it? Like lambs to the slaughter we just keep taking the unfairness. Why isn’t there blood in the streets? Inequality is one of those festering time bombs that lead to unrest and eventually someone getting hurt. Apparently that’s what it will take to rectify the situation. The author was a college professor for many years, with experience teaching numerous management courses. He has worked for IBM, several banks and securities firms, and owned a number of small businesses. Professor Sill is a scientist and a manager. Maybe even a little salesman, judging from his public speaking abilities. Above all, a leader. His education consists of an MBA from Hood College and Doctoral research in Strategy at Ecole Superieure de Commerce de Grenoble in France, Henley Management College in England and Newcastle University in England. He believes the purpose of a good teacher is to have students leave questioning, or thinking how to be innovative. And just maybe, leave the course a little kinder. Bob is currently retired and a widower. Spending time with, and encouraging, his two grown children is a pleasure and priority.